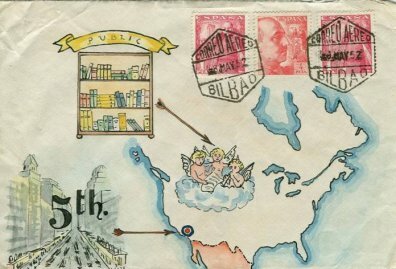 On May 8, 1952 two Spaniards from Bilbao, Spain sent a letter to the Los Angeles Public Library in hopes of winning a bet. The bet was based on the envelope (shown above) in which the letter was enclosed. The envelope was addressed only with a drawing, and the bet was that this would be sufficient to get the envelope and enclosed letter delivered to the library. The letter (English on one side and Spanish on the other) requested that the director of the library respond if it arrived safely. The letter did arrive safely, and Harold L. Hamill, City Librarian, sent an acknowledgement of this on May 23, 1952, along with two library brochures. Hamill indicated that the library staff was impressed by the quality of the drawing, and that everyone who had seen it had commented on its interest. I recently acquired the envelope and its contents along with a copy of Hamill's response. They make nice additions to my postal librariana collection. As I noted in a previous post, for several years I featured a monthly "library cover story" on my Library History Buff website. Philatelists refer to envelopes that have been sent through the mail as covers. This is the best library cover story ever. What a fantastic story and a prize collectible. I remember reading that former San Francisco Chronicle columnist, Herb Caen, received a letter that had a drawing of a small plant bouquet(herb) and a walking cane. Nothing else was included with the address, except for San Francisco. I wonder if this would be delivered today. My brother runs a sorting machine at a huge US Postal Service sorting center and was telling me recently that the machines OCR the street address and city (but NOT the ZIP code!!) and route your mail accordingly. Something like this beautiful envelope would clog up the system. Apparently today it might get sent to the west coast where it might get sorted out by hand in narrower and narrower circles until maybe it got delivered to the public library. Or not. Someone in Spain should try it again. Why would the library have deaccessioned this gem? And yet when I address a letter to my cousin in Texas and leave off his last name, the post office refuses to deliver it! Next time I will add a picture. Calligraphy artists have a "beautiful envelope" contest annually. Some Post offices get annoyed with the beauty and get out their rubber stamps and add stamps chiding the sender for not following postal rules about the arrangement of info on the envelope. Poor sports, I say.